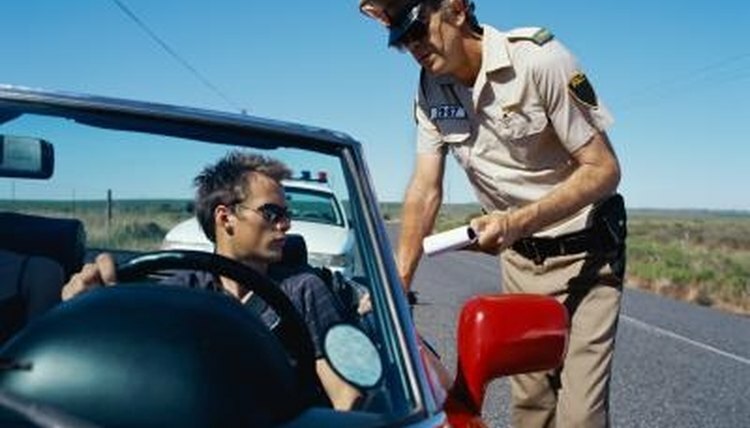 Most traffic tickets are issued for "infractions," which are minor moving violations. Very serious traffic offenses are categorized as "felonies." However, some traffic offenses fall into the middle category of misdemeanors. Misdemeanors can result in very high fines, imprisonment or loss of driving privileges. Although misdemeanors differ from state to state, there are certain principles that apply to almost all misdemeanors. An infraction is a minor traffic violation, but it can become a misdemeanor if it causes another person to be injured or property to be damaged. It can even turn into a misdemeanor if it threatens a person or property. For example, neglecting to wear a seat belt would be an infraction. Running through an obvious red light may be a misdemeanor because it could seriously harm other drivers. A misdemeanor can escalate to a felony if it is done maliciously and/or it causes major damage. For example, if a driver ran through a red light and intentionally hit another vehicle, the charge may be classified as a felony. It would be even more likely to be classified as a felony if a passenger in the other vehicle died in the crash. Some common examples of misdemeanor traffic violations are driving under the influence of drugs or alcohol (DUI), causing an accident and driving away, driving without a license, driving without valid insurance, and driving recklessly. Because a misdemeanor is a type of crime, the accused will often be taken into the police station and will be required to pay bail before leaving. The driver must later appear in court to enter a plea (guilty, not guilty or no contest). In some cases, the judge will let the driver go after this appearance, but the process may drag out beyond this stage, with a pretrial and a jury or court trial. A driver charged with a misdemeanor may be required to pay a high fine or given a prison sentence for a short amount of time, depending on the circumstances of the misdemeanor. If you have been charged with a misdemeanor, make sure to take the charges seriously. To start with, speak with a traffic ticket attorney, who will be able to discuss the possible consequences of the charge with you. The attorney will may be able to argue on your behalf to ensure that you attain the best possible outcome. Perles, Carrie. "What is a Misdemeanor Traffic Violation?" , https://legalbeagle.com/5038945-misdemeanor-traffic-violation.html. Accessed 18 April 2019. What Is the Penalty for Road Rage in Texas?